What is In-Vitro Fertilization or IVF TECHNOLOGY? In-Vitro Fertilization or IVF is an assisted reproductive technology (ART). IVF process required the fertilization by extracting eggs retrieving a sperm sample and then manually combining the egg and sperm in a laboratory dish. The embryo or embryos are then transferred to the uterus after the combination. Gamete intrafallopian transfer (GIFT) and zygote intrafallopian transfer (ZIFT) are other forms of ART.IVF is one of the effective way for treating infertility caused by ovarian disorders, premature ovarian failures or fibroids or blocked fallopian tubes in women and male factor fertility caused by low sperm count.It is also an effective treatment for women who have had their fallopian tubes removes or any other unexplained infertility and male with any genetic disorder.The successful rate for treating infertility with IVF mainly depends on number of factors like causes of infertility and of course, reproductive history, maternal age and lifestyle factors. But in reality, IVF is considered to be an effective treatment for infertility in childless couples. For stimulating egg production fertility medications are recommended. Multiple eggs may be desired because some eggs will fail to develop or fertilize after retrieval. 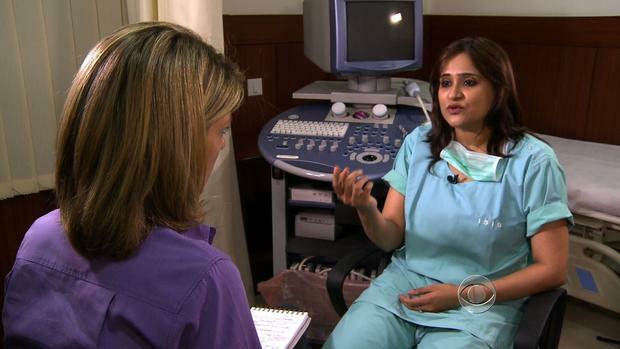 A trans-vaginal ultrasound has been adopted to examine the ovaries, and blood test samples are collected to check hormone levels. With the help of a minor surgical procedure eggs are retrieved through ultrasound imaging to guide a hollow needle through the pelvic cavity to successfully remove the eggs. Medication is advised to reduce and remove further potential discomfort. A sample of sperm collected from male, which will be used for combining with the eggs. The sperm and eggs are mixed together and collected in a laboratory dish to encourage fertilization and this process is known as insemination. The process of intracytoplasmic sperm injection (ICSI) may be used in some situation where there is a lower probability of fertilization. During this procedure, a single sperm from male is injected directly into the egg in an attempt to achieve successful fertilization. Three to five days after the egg retrieval and fertilization the embryos are usually transferred into the woman’s uterus. A small tube or catheter is inserted into the uterus to transfer the embryos. This procedure is free from any sort of pain for most women, although women may experience mild cramping. If the procedure is successful, the implantation normally occurs around six to ten days after egg retrieval. After the process of IVF most women can start doing normal activities in the following day itself. Some side effects after IVF process include passage of small amounts of fluid in women after the procedure. The produced fluid can be clear or slightly colored with blood. Bloating and mild cramping can also considered as side effect. Some women also experienced tender at breasts and constipation after the procedure as side effects. Some potential problems like blood in the urine, pelvic pain and fever over 100.5°F and heavy vaginal bleeding should be thoroughly checked by doctor immediately. The side effects of fertility medications may include headaches, abdominal pain, hot flashes and abdominal bloating mood swings or hyper-stimulation syndrome (OHSS). Posted on March 9, 2019 Categories IVFTags In-Vitro Fertilization, intracytoplasmic sperm injection, IVF and embryo transfer, Side effect of IVFLeave a comment on What is In-Vitro Fertilization or IVF TECHNOLOGY?